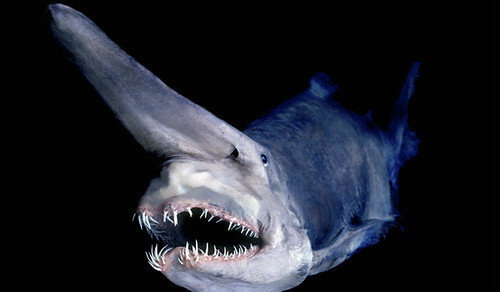 Little is know about the goblin shark, their deep sea dwelling causes their sightings to be rare. They have been known to swim in the Gulf of Mexico, California, Japan, South Africa, and the Indian ocean. Male Goblin sharks commonly grow between 8 and 10 ft long and females between 10–11 ft.
What Does A Goblin Shark Eat? The Goblin Shark most likely eats small fish. Since there isn't very much research that has been conducted on Goblin Sharks, scientist aren't 100% sure of their diet. It is believed that their pointed teeth help grab small thin-skinned fish at close range, which makes them fall into the carnivore category. It's long head and tail give it a strange, otherworldly, look. Due to their deep sea habit, Goblin Sharks have had very little contact with humans. They're not that dangerous, but we're sure gonna keep our distance. Ain't yo mama's shark website! While most shark websites go light on the details you really want, at Bite by a Shark we give you the goods: the interesting facts you haven't heard, shark attacks, shark games and a little Bite by a Shark comedic twist. Which Shark would you be? © Bite By A Shark. All Rights Reserved.